IIEX Behaviour Summary - behavioural science research - Hotspex, Inc.IIEX Behaviour Summary - behavioural science research - Hotspex, Inc. Most importantly, the market research industry is working hard to bridge the “Say vs. Do” Gap by augmenting traditional methods with the latest tools / methods grounded in behavioural sciences. Why? Because they are more effective at predicting future behaviours. Research methods grounded in behavioural science and behavioural theory allow us to quantify and predict outcomes more effectively, which can help better inform marketing spend. And there is a BIG opportunity for us to do better. In 2018, global advertising spend is forecasted to be ~600 Billion USD (source:Statista); yet we know, from the IPA, that effectiveness of advertising is falling (right). As marketers and researchers, there is a clear opportunity to better predict winning ads / communications. How can we do this? A focus on consumer behaviour. This can be done by understanding both conscious and unconscious response to ads. At Hotspex, we combine our in-house implicit techniques in combination with behavioural metrics (e.g. eye tracking) and most importantly, emotion to fully understand the viability of new communications. We know that “effective ads work on the heart, not on the head” (source: IPA). Thus, we need to identify ads that connect with consumers on an intuitive and emotional level. For example, Lucozade’s “Made to Move” campaign effectively conveys energy by showing how their product can help support you in your fitness journey and strikes an emotional connection by charting the rise of Anthony Joshua from modest beginning to heavyweight champion of the world. There’s no rational claims; simply an illustration, a lifestyle brand for consumers to connect / identify with. For many clients, behavioural sciences and behavioural economics is a relatively new topic. Thus, understanding clients’ barriers to adopting these methods is critical. Applying a behavioural lens can help. Loss Aversion:as clients consider changing from traditional methods, there is a natural concern for what can be potentially lost. To help overcome this, consider introducing new methods slowly over time to help create a sense of comfort and acceptance. Complexity:the scientific rigor behind your research method is critical, but it can often be quite complex. Several clients at the conference cited a clear need to describe and explain methods in a clearer and simple manner. This will help clients to sell these ideas to internal stakeholders (who are very much focused on the strategic value). To encourage trust and adoption of new methods, we need to clearly showcase the value of behavioural methods. Validation: at Hotspex we have done extensive research on research to validate our behavioural tools, such as our online attention tracking tool Eyespex™ (Seeing is NOT Believing). Clear and compelling validation is critical to help persuade doubters. With its Academic background and reputation, Jemma Ahmed of Etsy reminded us that behavioural science can all too easily gain a reputation for slow delivery and high cost. Clients’ need for nimble solutions is growing; thus, our methodologies must bear in mind the impact on both timing and budgets. It is therefore important to reassure on time and cost-effectiveness. This fits with our beliefs here at Hotspex that the behind the scenes rigour of behavioural science must not be at the compromise of our clients’ budgetary pressures and tight deadline needs. At Hotspex, these are cornerstone principles that inform how we evaluate brand, packaging, distinctive assets, and more. 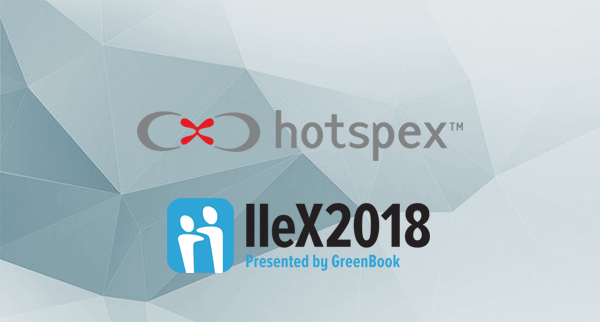 If you are interested in learning more, please reach out to request a Hotspex Lunch & Learn on Behavioural Sciences (email us at brandbuilders@hotspex.com), or catch Hotspex’s presentation at IIEX North America in Chicago on June 12th (click here). Thanks again to speakers and organizers of IIEX Behaviour. We will see you again in 2019!